The Knicks haven’t been relevant for much of the 2000s, but armed with the fourth overall pick in this year’s draft, they were primed to (again) start the rebuilding process. And for a few minutes on Thursday night, it looked like they might finally catch a break, when the Lakers selected Ohio State’s D’Angelo Russell second overall, rather than Duke’s Jahlil Okafor, a big man who was the consensus No. 1 pick for much of the college season. The Sixers, many believed, wouldn’t take Okafor with the third pick, since they’d taken centers in the past two drafts. But Philly expertly trolled Jim Dolan & Co., picking Okafor and leaving the Knicks, and their long-suffering fans, without a clear choice. 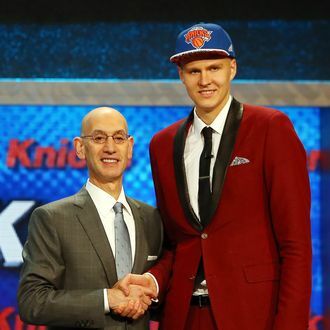 And so with the fourth pick, Knicks president Phil Jackson instead took what he considered the best player available: Kristaps Porzingis, a 7-foot-2 Latvian who visits Worldstar Hip Hop at least once a day, wants to take Rihanna on a double date with Jay Z and Beyoncé, and resembles an extra in a Dolph Lundgren movie. So what type of player is Porzingis? Among NBA executives, he is far from a mystery prospect, as teams have salivated over Porzingis’s potential for years. The forward might be the best shooter in the entire 2015 NBA draft, a Dirk Nowitzki–like player with a more mechanically sound jumper. His range extends well beyond the three-point line, and his quick feet and body control lead to an effortless motion. That shooting will spread the floor and open lanes for Carmelo Anthony and his teammates. Perhaps most important to Jackson, Porzingis could be a perfect fit for the Knicks’ triangle offense. According to Synergy Sports Technology, Porzingis makes 53 percent of his shots when coming off screens, and his game is primed for pick-and-pop excellence. However, since he is the Knicks’ pick, of course there are concerns he’ll be a bust. Cameras showed a child crying when Porzingis walked on to the Barclays stage, and the team has arguably the worst track record selecting international talent. Danilo Gallinari is the only European who carved out a sizable role in the Knicks’ lineup, and the past is littered with failures — choices like Frederic Weis, Nene, and Macej Lampe, among others. The concerns voiced by Fraschilla and others are as follows: Porzingis is only 19 years old, so youth is one issue. He is also wiry, which in this instance, isn’t a good thing. He’ll be pushed around by fellow NBA bigs, and until he starts adding strength, his defensive impact will be minimal. Regardless of what else Jackson accomplishes as Knicks president, he’ll be judged by how Porzingis performs and how quickly he can make an impact. But it could be two or three years before he does: He’s a project who likely won’t immediately start (or even be a sixth man) the way Stanley Johnson, Justise Winslow, or Frank Kaminsky would have. Translation: Carmelo still needs to carry this team. “We felt the risk [and] rewards were the greatest with this guy, perhaps, than the whole lottery,” said Jackson, who also on Thursday was reportedly set to trade Tim Hardaway Jr. to the Hawks for Notre Dame’s Jerian Grant, who was selected 19th overall. (A point guard with great three-point range, Grant thrives in pick-and-roll situations.) As for Porzingis, his ceiling is high, and as the league increasingly demands more versatile and position-less players, he’s a perfect fit in the NBA’s lineup evolution. But for Knicks fans who suffered through a 17-win season and want a playoff appearance in 2016 (and not in 2018), the pick disappointed nonetheless.